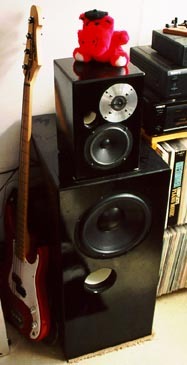 In 1992, I got the urge to build myself a pair of excellent stereo speakers. In the summer of 1994, I finally had the time and money to do something about it. After reading the standard articles by Thiele and Small, and going through the relevant parts of Vance Dickason's Loudspeaker Design Cookbook , I was ready to design them. As often happens, I got carried away with cool ideas and overdid it. 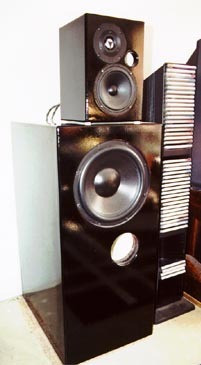 The speakers use an active crossover and have separate woofer and midrange/tweeter enclosures. The midrange and tweeter units can be used by themselves, if portability is required, by changing a few jumpers inside the crossover. The woofer boxes are 14" wide by 18" deep, and stand 30" high. 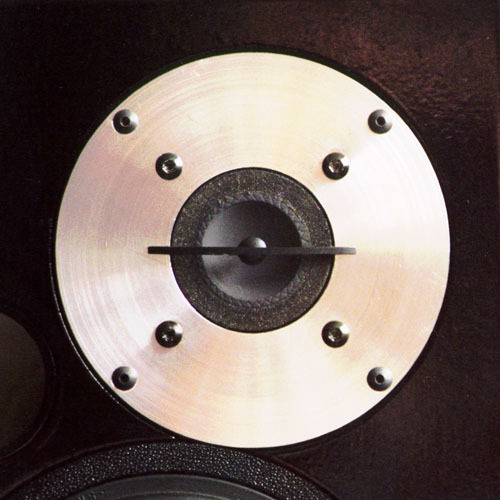 The midrange/tweeter boxes sit on top of the woofer boxes, and are 7" square by 12" high. They are painted gloss black (DuPont IMRON epoxy-based paint). I recently (April 1999) upgraded the tweeters from Vifa brand aluminum domes to Focal brand titanium oxide inverted domes. The mounting plates for the Focal tweeters were cheezy, so I machined some nice aluminum mounting plates [picture]. The photo on the left is pre-upgrade, and the one on the right is post-upgrade.